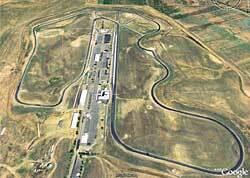 Thunderhill Raceway Park is a road racing course located 7 miles West of Willows, California on Hwy 162. The course is a fast series of twists and turns with minor elevation changes. Thunderhill is owned and operated by the San Francisco Region of the SCCA. It is host to many motorports events for cars and motorcycles. The SCCA uses Thunderhill for its automotive race competitions. The standard road course at Thunderhill Park is a 3.0-mile, 15 turn course, however the track is configurable and event organizers can configure the course as they see fit. In 2014 a second 2 mile road coarse will be opened just west of the current 3 mile course. GGR plans to hold events on the original 3 mile course, the new 2 mile course and the combined 5 mile course. Below is a video of a GGR event held at Thunderhill in 2013.